For a brief period, it appeared the whole NFL kneeling thing was winding down — and then bam, back to the drawing board, boys, as Commissioner Roger Goodell apparently didn’t tell football players they had to stand for the national anthem, after all. Whew. For a second there, it seemed like there was going to be a run on Doritos and dip. The groceries, and Sunday snack stashes, appear safe, at least for the time being. Here’s the latest in this whole fake social justice fight — fake, because it’s based on a false narrative that white police randomly and rampantly target blacks and minorities to gun down and kill. Think Colin Kaepernick, circa August 2016, decked in police pig socks. Anyhow: President Donald Trump has been on the right side of this NFL kneeling issue from the start, calling out league officials for allowing their paid players to use the football field — their place of business — for political protests. And just this week, Trump took to Twitter to suggest that stripping the NFL of its tax breaks would be a smart move. White House press secretary Sarah Huckabee Sanders clarified that Trump was referring to the “billions of taxpayer dollars” that go into the subsidizing of professional sports stadiums. “If this industry [the NFL] is going to use money from American taxpayers to build the very fields they play on, is it really too much to ask that they show respect for the American flag at the beginning of the game?” she asked. How nice. Goodell, who helped fuel the controversy in the first place by refusing to tell players to get off their knees, now wants everybody to move on — to play ball, so to speak. Pretty, pretty please, he says. 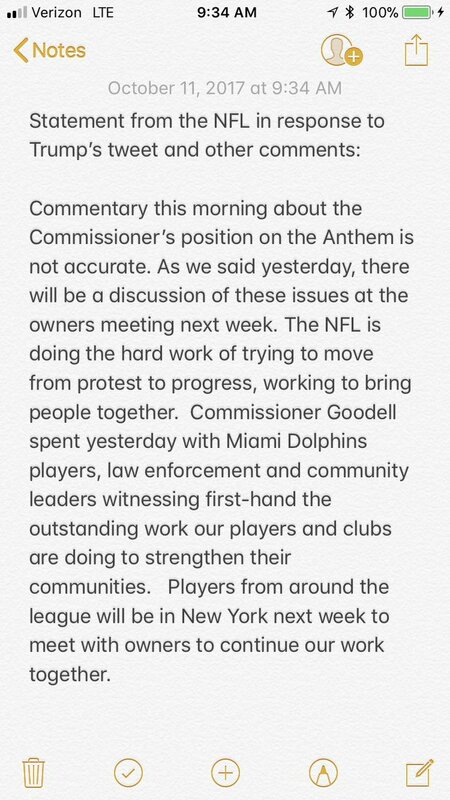 Well, there are matters still to be resolved — particularly since the NFL, in response to media reports that claimed Goodell told players to stand up, put out this clarifier: Umm, Goodell didn’t say to stand. Well, don’t look for the solution to come from this meeting, either. The whole anthem-kneeling stunt has little to do with police brutality or police bias — or truth, for that matter. Rather, it has to do with fighting a race war that was really ratcheted under the previous White House administration. It has to do with Eric Holder — rather, the Eric Holder style of race warfare. Holder, the attorney general for Barack Obama, spent much of his federal stint pressing causes for the Oppressed Black Man — freeing the felons, for instance, whose crimes he insisted were rooted in skin color, or putting the federal screws to local police, or delivering speeches that labeled the United States as a “nation of cowards” for failing to discuss and adopt his personal views of race. Well, Holder may be gone. But his spirit lives on. And it’s that spirit that seems to be driving much of the NFL players’ dig-in for kneeling. NFL Players Association executive director DeMaurice Smith has been a busy man-about-town lately, blasting team owners who won’t let their players kneel, releasing statements to the press about the poor players’ rights to free speech and so forth. And Smith’s background? Well, he worked as a trial lawyer — and as a counsel to then-Deputy Attorney General Holder in the Department of Justice. The apple doesn’t fall far from the tree, does it? These days, the NFL seems a lot more like an Obama-Holder face-off against perceived social injustices than it does an arena for professional athleticism. That one of the leading NFL voices of this social justice crusade is directly tied to Holder — and that he was probably mentored and guided and influenced by Holder — only makes perfect, absolute perfect, sense.